The following contains spoilers about the 「Game of Thrones」 Season 8 premiere. I was a talentless spoiler. 2) 表示“（飛機上用以減速嘅）擾流器；（汽車嘅）氣流偏導器”，英文解釋為：A spoiler is an object which forms part of an aircraft’s wings or part of the body of a car. It changes the flow of air around the vehicle, allowing an aircraft to change direction or making a car’s forward movement more efficient. The penultimate season of 「Game of Thrones」 was largely defined by bringing key characters together — some meeting for the first time, others reunited after having endured harrowing ordeals. He won gold on the penultimate day of the contest. We may all have had a harrowing time in the past few days. Overuse of credit cards has ratcheted up consumer debt to unacceptable levels. When working on my doctoral thesis, I often pause for a moment to marshal my thoughts. Unfortunately, the text is sprinkled with errors. Listening to customers is now part of the mantra of new management in public services. Being very good at science subjects, I stood a good chance of gaining high grades. Privatization goes against the grain of their principle of opposition to private ownership of industry. Her attitude is imperious at times. An amusement park is the perfect locale for youngsters to have all sorts of adventures. While that feels like nitpicking (hey, it’s what die-hards do), the show has stepped up its pacing. You’re always nitpicking – it’s so annoying! For the most part, that has been immensely satisfying, yielding crowd-pleasing moments that the series generally avoided in the often-grim journey, especially for the Stark kids, which has led to this point. In the premiere, that included fine scenes for the battle-hardened(久經沙場嘅) Arya (Maisie Williams), Sansa (Sophie Turner) and Theon (Alfie Allen), as well as the stunning if awkward meeting of Jaime Lannister (Nikolaj Coster-Waldau) and Bran Stark (Isaac Hempstead Wright). That last scene, which tantalizingly（撩人地；逗引性地） capped off the episode, dates back to what is essentially the program’s original sin. Caught in a compromising moment, Jaime threw Bran off a castle wall, crippling the boy, whose eerie mental powers are only one of the supernatural elements that have gradually permeated the series. Come on, we need to throw one last party to cap off our senior year! I walked down the eerie dark path. Bias against women permeates every level of the judicial system. The smell of roast beef permeated the air. Teachers are piloting a literature-based reading programme. He was chafing under the company’s new ownership. 「Thrones」 is an unwieldy beast, and it’s still possible that the show won’t be able to stick the landing. But if the premiere is any guide, like Jon and Daenerys』 dizzying date, the remaining five episodes promise to be a genuinely wild ride. They came panting up to his door with their unwieldy baggage. The benefits system is complicated and unwieldy and needs reforming. All phases of the sales cycle require great attention to detail but to be successful, we must “stick the landing” to close the deal. 實際上，stick the landing係體育領域裏嘅“行話”(jargon)，乜嘢意思，看下圖就明白how to stick the landing. This term is part of the jargon of gymnastics, aerial and freestsyle skiing, the long jump, various kinds of boarding, and other similar sports. 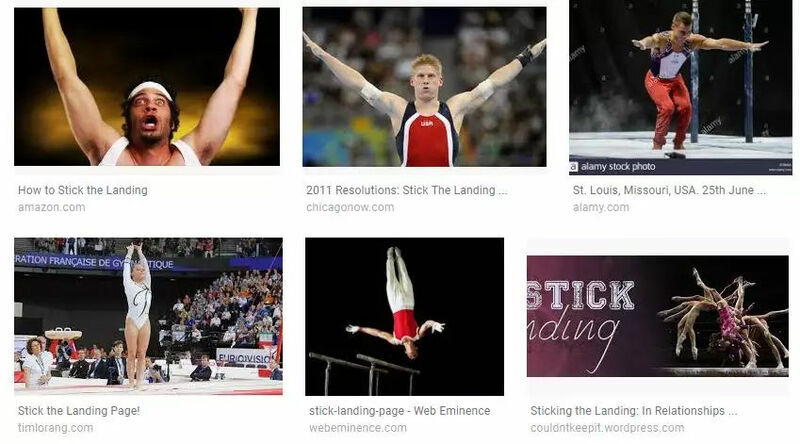 stick the landing: to finish an athletic, gymnastic, or other sports performance with an ideal pose or stance, especially after a jump or leap; (hence, also outside of sports) to do or finish well; to win.